What’s new in ELT Materials? The cynical will say that there is nothing new in ELT materials, and they would have a point. After all, there is nothing new under the sun. However, I think there are some definite trends, and new takes on old ideas, and plenty of inspiration to be found in the nominees for this year’s British Council ELTons awards. Read about five new (or nearly new) ideas in ELT materials here, my new post for the Voices blog. 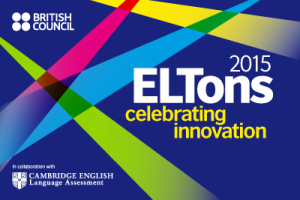 The Awards Ceremony is being live streamed on Thursday night, https://www.teachingenglish.org.uk/article/watch-eltons-awards-ceremony-live-online-–-thursday-4-june-1815-2015-bst so if you can’t make it, join the fun from afar. I will also be the official live-blogger for the event. As @muranava commented, may the wifi Gods be with me! Rachel: you are great and so is your material. You are very talented. And I am thankful with all my heart. I hope you go on sharing your knowledge set on work with all of us. Thank you very much. Ana, you are very kind 🙂 Thank you.